When the Clair de Lune Facial Treatment* launched, it generated a lot of excitement in the green beauty community. This is because the two much loved, California-based brands, Odacite Skincare and Moon Juice, collaborated to create a quality skincare duo with a less is more approach. Both brands are known for using the most fresh, (organic) bioactive ingredients available in their products, and avoiding synthetic preservatives. 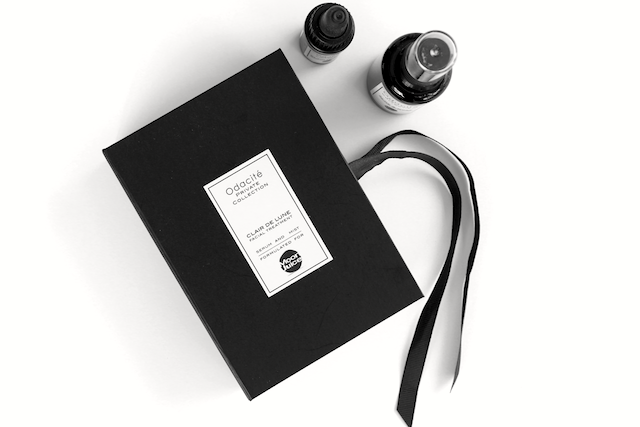 If you have been reading Genuine Glow for a while you probably remember that I have tried a couple of products from Odacite, and in particular I enjoyed a couple of bottles of their Rejuvenating Cleanser and their Chamomile serum concentrate (a good one for sensitive skin types). I most definitely opened my Clair de Lune kit with high expectations! The Facial Treatment comes with two products: the Revitalizing Mist, and the Radiance Serum, which contain respectively 30ml and 5ml of product. I used up both products in a little over a month. The treatment targets all skin types and it promises balanced, glowing skin. Glycerin: a humectant, which also helps to retain water in the skin and keep the skin surface hydrated. It also contains small amounts of Neroli flower oil, and ylang ylang. Flower oil is most likely included for aromatherapy purposes, and the scent is mild and pleasant. aloe vera leaf juice, rose flower water, sodium hyaluronate, glycerin, sodium levulinate (a gentle preservative), sodium anisate (another gentle preservative), aspen bark extract, sea daffodil extract, olive leaf extract, caprylyl/capryl wheat bran, straw glycosides, fusel wheat bran, straw glycosides, polyglyceryl-5 oleate, sodium cocoyl glutamate, glyceryl caprylate, neroli flower oil, ylang ylang. I found this face mist to be pleasant and hydrating. Having delicate skin that gets irritated very easily, I do prefer my face mist to have additional soothing ingredients (for example, chamomile and calendula), which help to soothe my skin after I rinse it with tap water (very irritating since it contains chloramine). However, if you want a simple, hydrating face mist to spritz after cleansing/before applying serum, this is a good one. Wild Carrot Seed oil: it’s rich in antioxidants. In particular, one of the active flavones in wild carrot seed called Luteolin has been evaluated for its effects on inflammatory skin disease in a 2014 study¹, and is considered a promising candidate for skin treatments for psoriasis and other skin inflammatory diseases. I foresee this ingredient getting more and more attention in the future! Green Tea Seed oil: I have written an entire post about the benefits of green tea in skincare, so you can read more about it here. In a few words, topical application of green tea-based products has showed photo-repairing and photo-protective benefits, helping the skin to heal from sun damage and to prevent it. It is the one ingredients I have been trying to use the most on my skin. Peach Kernel Seed oil: is a source of fatty acids, both linoleic and oleic. It is anti-inflammatory, and gives the most delicious scent to the serum. It is the ingredient to which Odacite attributes the “light, quick-sinking, and balancing texture”. I was unable to find studies about the balacing properties of peach oil for the skin, but the results that I experienced verified the claim (for me). The serum truly does not exacerbate oiliness. Rosemary Leaf extract: has antioxidant benefits² due to its phenolic content. carrot seed oil, green tea seed oil, peach kernel seed oil, rosemary leaf extract, vitamin E.
This serum has a very unique consistency compared to all the other face oils and serums that I have tried in the past. While it feels rich and has a high viscosity, (it’s so thick that you would expect it to sit on the skin) it applies smoothly leaving a silky finish, sinking in almost immediately and giving the skin a non-greasy, healthy-looking, glow. All the while smelling like peach, in the best way possible. It is just so so good. The glow that it gives my skin without exacerbating oiliness. However, while I found the serum to be awesome for my skin (perfect texture, non-greasy, radiance-boosting, lovely ingredients), I was slightly underwhelmed by the face mist. It is a good hydrating face mist, but not one I would rush to purchase. Therefore I wish that the two products where also sold individually. 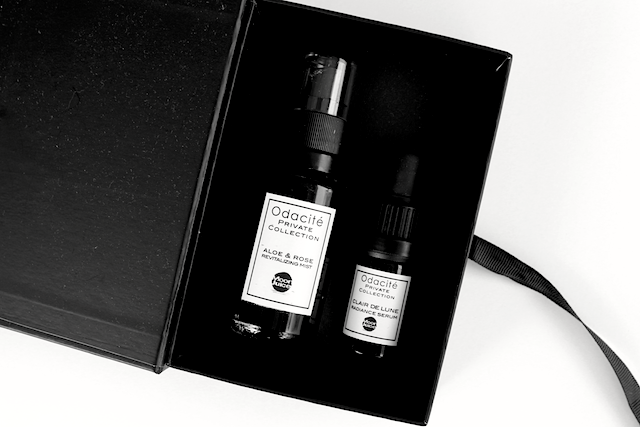 I should also mention that the products are more expensive than the other Odacite products, (because it is a special collection), so you do get less product for the same money, but I think that the serum is totally worth the extra cost. 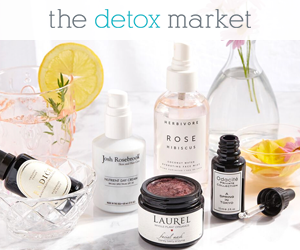 You can find it at The Detox Market.